Following on from my recent Jimmy Choo perfume gift set blog post, this week I want to show you the Marc Jacobs Honey set! I’m a massive Marc Jacobs fan, and I love all of his perfumes (except Lola.. eugh!). I have both Daisy’s and I adore them, and Dot. So I was really keen to try out the newest Marc Jacobs fragrance; Honey. 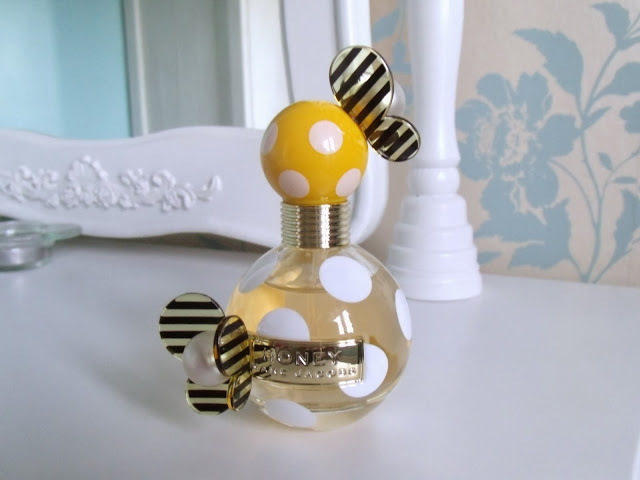 The bottle is styled much like the Dot fragrance, with a round glass bottle decorated with vibrant plastic wings. The bottle is yellow, black and white with polka dot and striped patterns and pearl accents. The gift set comes in a large cardboard box decorated with a large yellow bow on the front. The set contains a 50ml bottle of the Eau de Parfum, a 75ml body lotion and a 75ml shower gel. I wasn’t sure what to expect from the fragrance, but it actually does have a scent that reminds me of honey! It’s quite sweet, but not in a very young, girly way. It’s hard to describe, but it’s very ‘me’. The main scents in this fragrance are pear, fruity punch and mandarin, which is probably why I like it, as it is similar to Jimmy Choo original in my opinion (one of my favourites!). But it’s better suited to day time wear than Jimmy Choo, which is heavier and nicer for an evening. If you’d like to know the more technical side of the fragrance.. the heart notes are orange blossom, peach nectar, apricot and honeysuckle while base notes are honey, golden vanilla and smooth woods. Sounds yummy doesn’t it?! The gift set is £44.99 from Fragrance Direct (saving £8 off the RRP!) and is only £3 more than buying the eau de parfum on it’s own. So obviously it’s very worthwhile buying the whole set, especially as it comes so nicely presented. I really like this perfume. I didn't expect to like it as I don't like any other Marc Jabos fragrance but there is something so sweet and unassuming about it. I agree it would work nicely during the day. I think these colours also suit the bottle better. It looks more grown up. This perfume is right at the top of my Christmas wish list. It sounds like my kind of scent and the bottle would look stunning in any room. I saw the gift set in Debenhams over the weekend, it's such good value for money. I had a sniff of it a couple of months back and I really liked it but when I tried it again over the weekend it didn't seem to smell as good as I remembered it did, maybe it was a dodgy tester?